The Third of May 1808 is a painting completed in 1814 by the Spanish painter Francisco Goya, now in the Museo del Prado, Madrid. 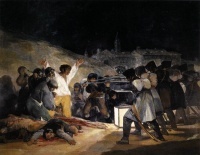 In the work, Goya sought to commemorate Spanish resistance to Napoleon's armies during the occupation of 1808 in the Peninsular War. Along with its companion piece of the same size, The Second of May 1808 (or The Charge of the Mamelukes), it was commissioned by the provisional government of Spain at Goya's suggestion. Both the night and symmetrical composition of the subjects stress the drama: the faces of those about to be shot are filled with feeling, while the soldiers are shown from behind, their humanity erased and their being reduced to mere components in the implacable machinery of death. The positioning of the soldiers and the man with arms upraised is both a conscious reversal of the poses of the main characters in Jacques-Louis David's Oath of the Horatii and a reminder of the crucifixion of Christ. The white of the victim's shirt represents the innocence and purity of the some 5,000 Spanish civilians who were executed between May 2 and May 3. The central hero's deeply suntanned appearance and clothing unmistakably indicates that he is an outdoors worker - an ordinary anonymous man at the centre of this great unfolding tragedy. He alone looks straight at the faceless enemy. Though on his knees he is a giant who towers above all at the very moment before his death. Its influence on later war painters is extensive, most famously Picasso's Guernica. Unless indicated otherwise, the text in this article is either based on Wikipedia article "The Third of May 1808" or another language Wikipedia page thereof used under the terms of the GNU Free Documentation License; or on original research by Jahsonic and friends. See Art and Popular Culture's copyright notice. This page was last modified 20:26, 24 March 2014.